I asked my mother for this recipe multiple times and never got it. Short memory I guess ;). Finally, after a very long time she told me what to do. I was a bit scared if I will be able to deliver but I managed to make it and it was really good. Enjoy! Prepare the fish the day before serving (or at least few hours before). Mix the oil with spices and rub it into cleaned and dried fish fillets. Refrigerate overnight. Clean the asparagus (remove 2-3 cm at the end, additionally white one must be peeled entirely, green one needs peeling to 1/3rd of length). Place the fish fillet on the plate, put the piece of cheese on it, asparagus and roll it if the fish fillet is big enough. Otherwise put one fish piece first and cover with the other one, use toothpicks to hold them together. Preheat the oven to 180°C. 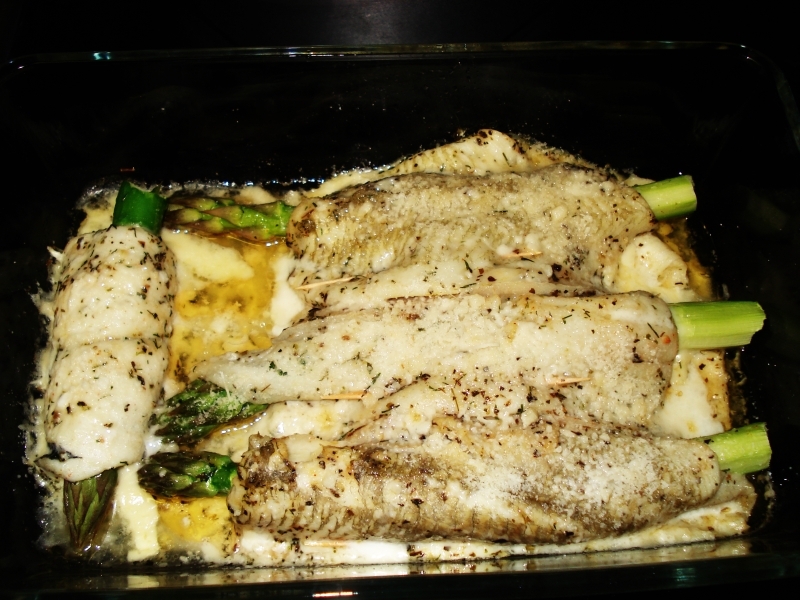 Place assembled fish fillets into the oven proof dish, cover with aluminum foil and bake for 20-25 minutes until soft.